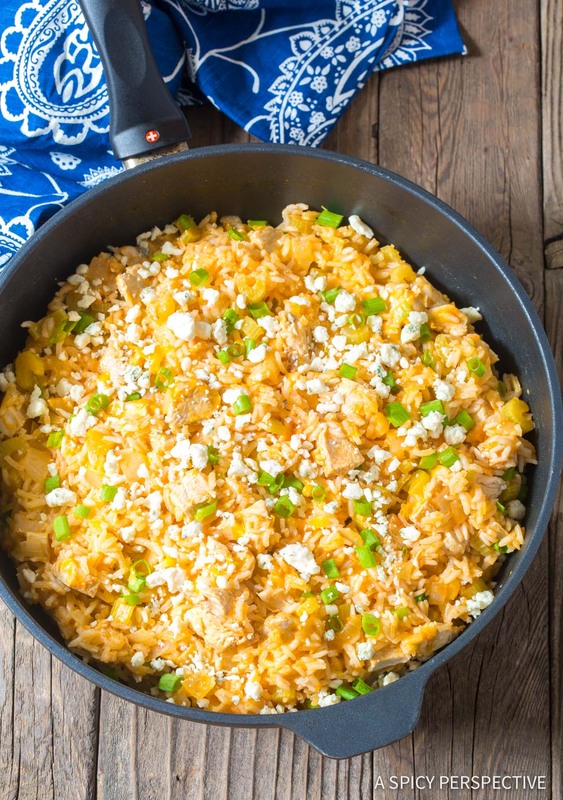 One-Pan Buffalo Chicken and Rice Skillet – A zesty skillet chicken recipe loaded with cheesy rice, buffalo sauce, and blue cheese! These are two words that fill my family’s heart with joy. 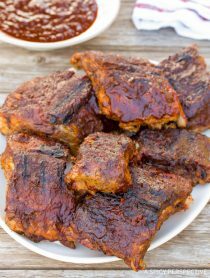 If I incorporate chicken and buffalo sauce in any kind of recipe, they will coming running to the kitchen in short time. 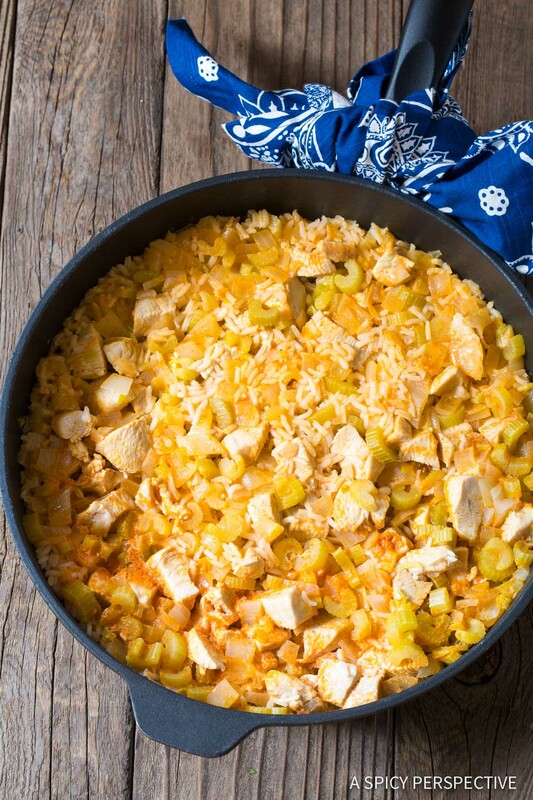 Today’s recipe, Buffalo Chicken and Rice Skillet, combines our family’s beloved dynamic duo of ingredients with my personal childhood comfort food, chicken and rice. 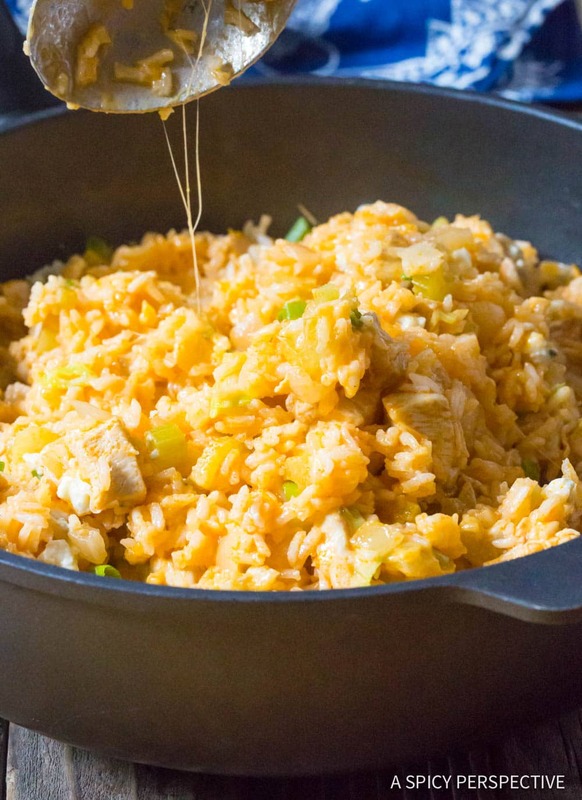 Chicken and rice is a simple dish my mom made regularly. An old-school one pot hero! Mom would slow cook a whole chicken with onions, celery, and carrots, then add in the rice to cook the last hour or so. When she pulled out the chicken the meat would be so tender it would fall off the bones, making it easy to fold into the rice. 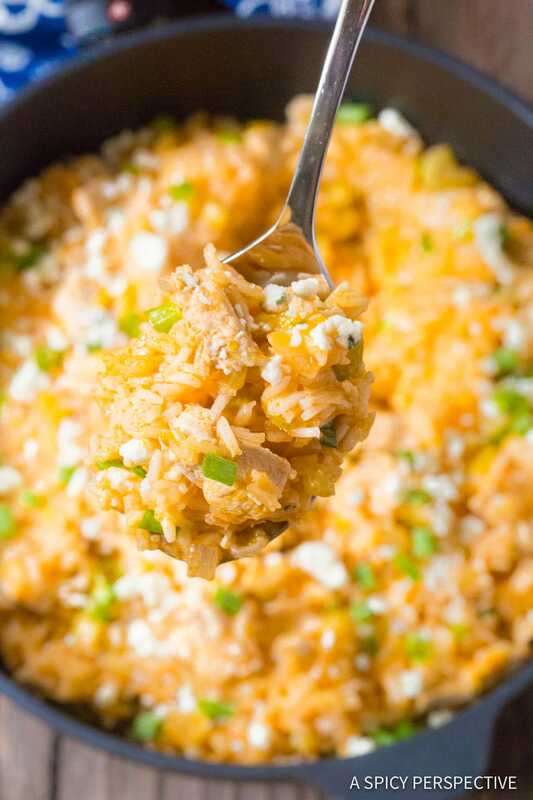 In this Buffalo Chicken and Rice Skillet I’ve made a quickie version of my mom’s recipe, adding buffalo sauce to the broth to cook the rice. Then at the end, I stir in shredded cheddar, blue cheese crumbles, and some chopped green onion. 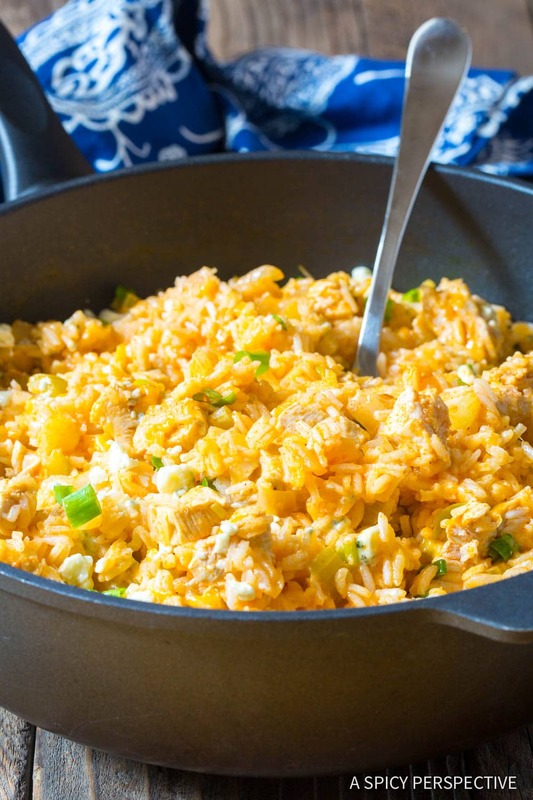 Yet you will be amazed at the praise this dish receives… And the battle over the last few scoops of rice in the skillet. 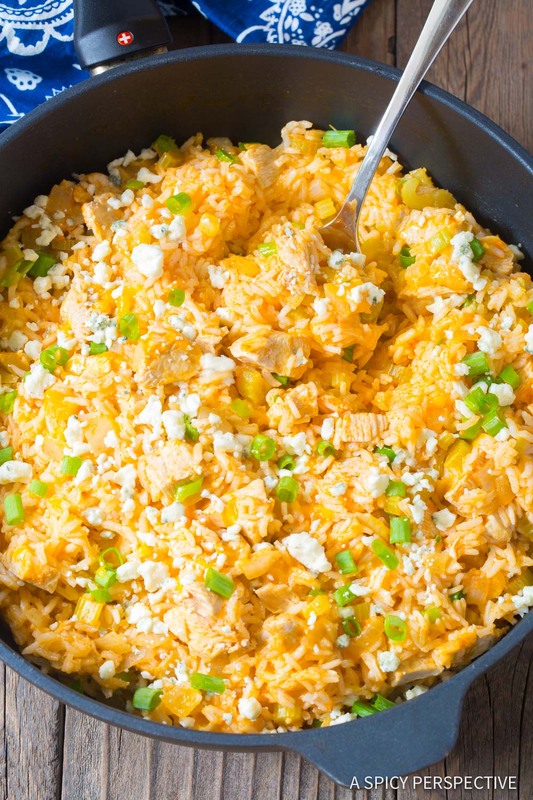 Buffalo Chicken and Rice Skillet not only makes a cozy dinner, it is a fabulous leftover to pack in school or work lunchboxes. 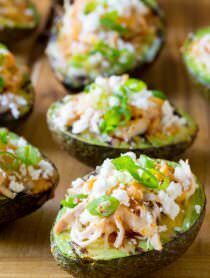 Try it with brown rice, or alternative cheeses as well! 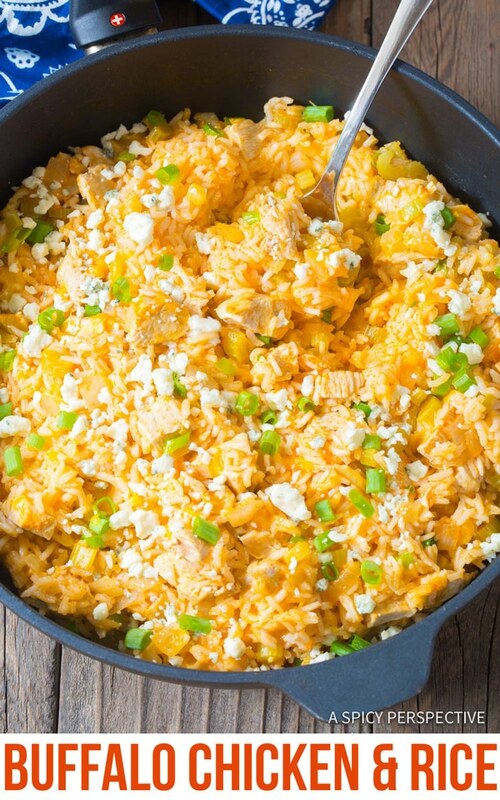 One Pan Buffalo Chicken and Rice Skillet Recipe - A zesty skillet chicken recipe loaded with cheesy rice, buffalo sauce, and blue cheese! Cut the chicken into 1-inch bite-size pieces. Chop all the vegetables. Place the butter in a large skillet or sauté pan, with a lid. Set over medium heat. Add the chopped onions and celery. Sauté for 3-5 minutes to soften. 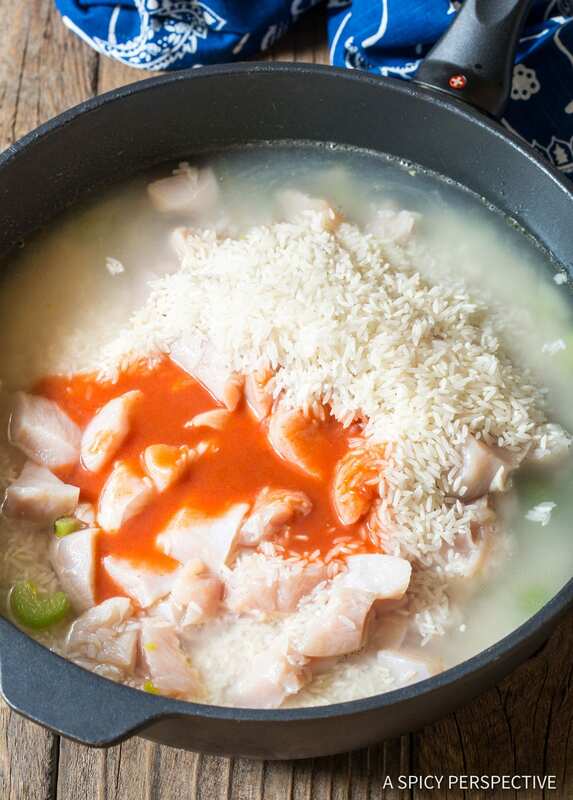 Add the chicken pieces, rice, hot sauce, broth, and 1/4 teaspoon salt. Stir, then cover the skillet. Bring to a boil. Lower the heat and simmer for 15 minutes, or until the broth has absorbed and there are air vent holes in the top of the rice. Fluff the rice with a fork. Stir in the cheddar, blue cheese, and green onions. Taste, then salt and pepper as needed. 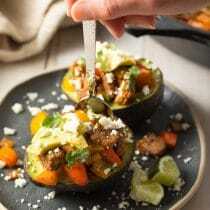 Such a fantastic dish! I can’t wait to try it! WOW! 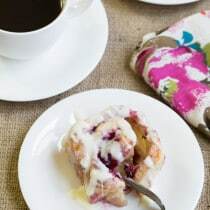 What a yummy dish! Thanks! 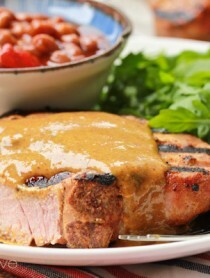 A great weeknight meal with lots of good flavor. 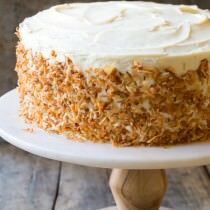 Thanks for a new go-to recipe! This looks soooo good! 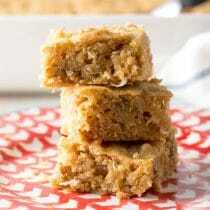 This is quick and easy for my family, and its full of protein! Has anyone ever tried making this with cauliflower rice? Used pre-cooked shredded chicken and added it when there was about 8 minutes left. Also had to add about 2 more cups of water to get to the point where the rice was cooked. This delicious, but it took a lot longer than 15 mins. to cook the rice. It took double that. So glad you liked it! However, is it possible you used a different variety of rice? Regular long grain rice should only take 15 minutes to cook, 20 tops. Do you think this could be made in a rice cooker? The chicken goes in raw and cooks with rice? You got it. Happy Cookings!